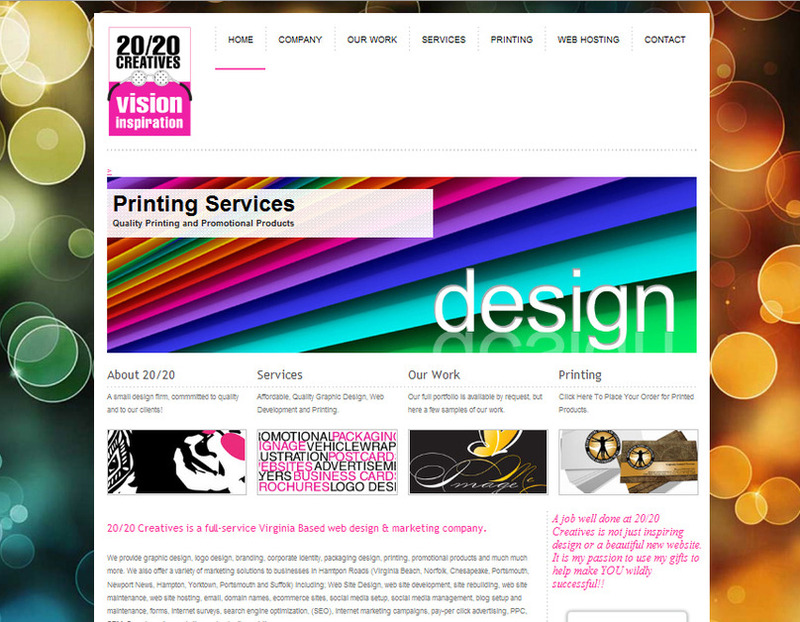 20/20 Creatives is a Virginia Beach based graphic design, website design, packaging design, printing services, web hosting, promotional goods, & internet marketing company. We provide graphic design, logo design, branding, corporate identity, packaging design, printing, promotional products and much much more in the area of brand and identity development, management and promotion. Website Design, website development, site rebuilding, website maintenance, website hosting, email, domain names, ecommerce sites, social media setup, social media management, blog setup and maintenance, forms, internet surveys, search engine optimization services, (SEO), internet marketing campaigns, pay-per click advertising, PPC, SEM, Search engine marketing and web site analytics.